Have you picked up some Travel games for kids? Here you go… grab some great boredom buster ideas to make the long boorring journey a rooaarring joy ride! Now all is set for a long road trip along with kids. So press the pedal down, set the engines rolling & enjoy the tour! 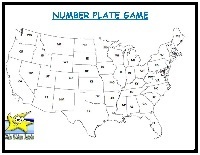 Game Objective: In this travel game for kids players have to score points (Runs) by adding the Number Plate/ License Plate digits in a certain manner. Game Learning: Mathematics, Addition & Multiplication. No. of Players: 2-4 kids. Make two teams and decide which team would bat first. The batting team would have to score as many runs (points) as possible within the allotted 10 chances. For scoring runs the batting team would have to note the registration number on the License plate/Number plate of the car that is just ahead of them. Add all the digits/numbers and multiply it by total number of vowels. For e.g. Suppose if the number plate reads MA74KLU, then score would be (7 + 4) x 2 = 22. If in case the answer comes as Zero (0), then it is OUT and 9 (10-1) chances are left with the batting team. For e.g. if the number plate reads BRF52HS, then the score would be (5 + 2) x 0 = 0. If their Car overtakes that Car before the scoring for that particular chance gets complete, then it is OUT. This way the batting team would continue to score runs till all the 10 chances are OUT. At the end all the 10 scores are added resulting into the final score. The second team would now have to beat that final score (scored by the first team) following the same set of rules. The team that outplays the other WINS this superb travel game for kids! Just ensure that the kids don’t get too excited with this travel game for kids and cause a hindrance to the driver while checking out the front car’s Number Plate/ License Plate. Also, a pen and a notepad can be handy to note down the scores. Game Objective: In this exciting travel game for kids the players have to spot certain things on their side of the road to score points. Game Learning: Observation skills & Basic Math. No. of Players: 2 and above. Total points to be scored by each player/team is 100. Player/team sitting on the Left side of the Car would have to spot the things that come across on the Left side only and vice-versa. Spot a Cattle (Cow, Buffalo, Lamb etc.) – 5 points. Spot a road turning Left (for the Left side player/team) and vice versa – 10 points. Spot a Horse – 15 points. Spot a Dog – 5 points. Spot a Take Away food joint (like Mc Donald’s) – 20 points. Spot a Fuel/Gas station – 10 points. Spot a Bus Stop – 5 points. Spot a Cross-Road – deduct 10 points (for both the players/teams). If the driver turns Left or Right then the respective player/team would get – 15 points. Divide the kids into two teams “Team L” & “Team R” if there are more than 2 kids. Start the play as soon as you hit the highway. The team/player that scores the 100 points first WINS this fun travel game for kids. Again, a notepad and a pen can be handy with kids to allow them to keep track of their scores. To make this travel game for kids more challenging or easier parents can tweak with the scoring rules stated above. Alter the total points to be scored, add or decrease the ways one can score points, etc. Game Objective: In this wonderful travel game for kids the players have to look out for the letters of a given word following certain rules. 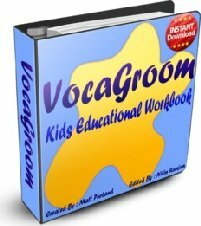 Game Learning: Observation & Word formation. If there are more than 2 kids playing this travel game for kids then divide them into 2 teams. “Team L” and “Team R”. The Car driver would say a word (for e.g. TRAVEL) that the kids/teams have to form by tracking out every letter/ alphabet of the word. Player/team sitting on the Left side of the Car would have to spot the letters/alphabets on the things that come across on the Left side only and vice-versa. The word has to formed in correct sequence i.e. T-R-A-V-E-L.
Only one alphabet (that is in sequence) can be picked from a particular thing, even though that thing/object is having another alphabet of the word. For e.g. “Team Right”, on their side of the road, comes across a Hospital named “Max Healthcare”, then they can only pick the letter “a” off the word “Max” even though letters/alphabets “e” “a” “l” are also there. This way teams would try to form the complete word “TRAVEL” by picking up one letter (sequentially) at a time. The team that does it first WINS this cool travel game for kids! For smaller kids parents can entice them to complete the Alphabets A to Z and then reverse the order Z to A following the same set of rules as given above. Game Objective: In this travel game for kids one player gives a Hint and other player Guesses the thing! Game Learning: Listening and Comprehending. The first child would then give a brief description of the thing (animal, bird, plant, tree, celebrity, building, city, vehicle, place, etc.) that he wants the second one to guess. Suppose the first kid has thought about “Police”, then he could give a hint to the second kid like – “they have flashing lights on the tops of their cars”. The second kid would get only 2 hints to guess the thing correctly. Still if the second kid could not guess the right answer then the first child would WIN and scores 1 point. Now the second child would ask the question and the first one has to guess. Player who scores 10 points first would be the WINNER of this travel game for kids! 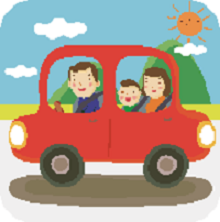 If you have a single child who is travelling with you on a long drive then one of the parents can become his/her “Travel Pal” and start this kids travel game to keep him happy and entertained. Don’t overlook the hidden learning factor of this travel game or kids. Game Objective: In this travel game for kids the player has to look out for the License Plate of the Cars. This game is also called Number Plate Game in many countries. Game Learning: Observation skills and Geography. A box of Crayons or color pencils. A printable game map. Grab a FREE copy here! Give a print-out of the game map and a box or crayons to the kid as soon as you hit the highway. Explain to the kid that he/she has to look out for the cars/vehicles that are either in front of their car (one whom you are following) or just behind their car (one that is following your car) and notice their License Plates/Number Plates. Once the kid identifies the state to which the car belongs, he/she then has to color that state on the game map. The child can prefer to fill the same color as the color of the car. See if he/she can fill out the complete game map this way. If not, then he/she can carry forward this travel game for kids for the return journey. This popular travel game for kids comes very handy when there are 2 or more kids. Simply distribute a separate set of game map and Crayons to every child and let them compete. The WINNER would get an extra scoop of ice cream when you halt at the next food joint for meal. Game Objective: A travel game for kids in which a child has to look out for various things that come across on both sides of the highway. A printable game sheet having pictures of various things that are commonly seen along the highway. Grab a FREE copy here! Give a print-out of the game sheet& a pen/pencil to the kid as soon as you hit the highway. Explain to the kid that he/she has to look out for the things whose pictures are shown on the game sheet. As soon as the kid notices a certain thing, along the highway, whose picture is given on the game sheet then he/she has to put a big tick mark/check mark on that picture. After this he/she can write a simple sentence on the word on the back side of the game sheet (provided the kid is capable to “write” at his/her age). See if he/she can find out all the things given on the game sheet this way. If not, then he/she can carry forward this travel game for kids for the return journey! This popular travel game for kids comes very handy when there are 2 or more kids. Simply distribute a separate set of game sheet and Pen/Pencil to every child and let them compete. The WINNER would get an extra scoop of ice cream when you halt at the next food joint for meal. Game Objective: A travel game for kids in which a child has to look out for different Traffic Signs that come across on both sides of the road. This game is also called Road Signs Game. Game Learning: Observation skills and general traffic sense. 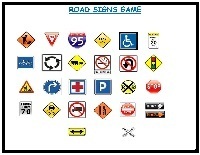 A printable game sheet having pictures of various Traffic/Road Signs that are commonly seen along the highway. Grab a FREE copy here! Give a print-out of the game sheetand a pen/pencil to the kid as soon as you hit the highway. Explain to the kid that he/she has to look out for various traffic/road signs whose pictures are shown on the game sheet. As soon as the kid notices a certain sign whose picture is given on the game sheet then he/she has to put a big tick mark/check mark on that picture. After this he/she can write in one sentence what that traffic/road sign imply on the back side of the game sheet (provided the kid is capable to “write” at his/her age). If he/she could find out all the Traffic/Road Signs given on the game sheet then it would be great. If not, then he/she can carry forward this travel game for kids for the return journey! Game Objective: A travel game for kids in which a child has to look out for different Transportation and Utility Vehicles that he comes across on both sides of the road. Game Learning: Observation skills and general knowledge. 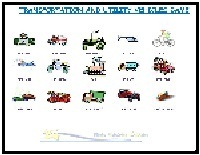 A printable game sheet having pictures of various Transportation and Utility Vehicles that are commonly seen along the highway. Grab a FREE copy here! Give a print-out of the game sheet and a pen/pencil to the kid as soon as you hit the highway. Explain to the kid that he/she has to look out for various Transportation and Utility Vehicles whose pictures are shown on the game sheet. As soon as the kid notices a particular vehicle whose picture is given on the game sheet then he/she has to put a big tick mark/check mark on that picture. After this he/she can write in one sentence what that Transportation and Utility Vehicles is meant to do or its main features on the back side of the game sheet (provided the kid is capable to “write” at his/her age). See how many vehicles he/she could find out during the entire trip. This popular travel game for kids comes very handy when there are 2 or more kids. Simply distribute a separate set of game sheet and Pen/Pencil to every child and let them compete. Reward the WINNER with his/her favorite chocolate bar when you halt at the next food joint for meal. Game Objective: A travel game for kids in which one has to dial the numbers on a Mobile phone’s keypad such that it forms a meaningful word. A mobile phone (of one of the parent’s). The first player would think of a word not more than 5 letters long, for example, PHONE. On the keypad of a mobile phone he/she would dial the numbers sequentially such that it forms that word. For example, the word PHONE could be dialed by punching 74663 on the keypad, i.e. by pressing the respective number key for the corresponding letter only once. The first player would now show that number (i.e. 74663) displaying on the screen to the second player. The second player has to decode this number and guess the correct word by making all the possible combinations of the letters corresponding to every number. The second kid would get only 2 chances to guess the word correctly. If he/she could not guess the right answer then the first child would WIN and scores 1 point. A notepad and a pen can be handy with kids to allow them to keep track of their scores. Game Objective: A funny travel game for kids in which one has to enlist some reasons to justify his/her stand against other’s opinion about him/her. Now the second child has to cite 3 reasons to justify his/her claim. He/she could say that “I am not that tall”, “I don’t have windows” & “I don’t run an elevator”. Set the time limit within which a kid has to answer. Ideally, it could be 30 seconds to 1 minute, depending upon the age group of the players. The second kid would now start the new round by asking a similar question to the first kid, but he/she has to include the object or the thing that he/she had used in the last (the third) reason. That was “Elevator” in this case. This travel game for kids would continue till the liking of the kids, with players taking turns to pop the question.